Christopher W. Hansen is the President of the American Cancer Society Cancer Action Network (ACS CAN), the nonprofit, nonpartisan advocacy affiliate of the American Cancer Society. As President, Hansen leads an organization of more than 250 staff in Washington, D.C. and across the country in support of laws and policies that help people fight cancer and advance the Society’s mission to save lives from cancer and create more birthdays. He was named to the position in June 2010. Hansen is a seasoned nonprofit and corporate leader with more than 40 years of Washington experience. He joined ACS CAN in June 2010 after serving as the President and Chief Executive Officer of the American Electronics Association at a pivotal time for the organization, leading its successful transformation in a 2009 merger with several other technology groups to form TechAmerica, the nation’s largest association representing all segments of the high-tech industry. 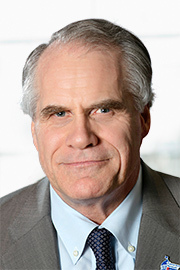 Hansen served as the new organization’s Chief Executive Officer before becoming CEO Emeritus and President of the association’s 501(c)(3) affiliate, TechAmerica Foundation. Prior to his tenure in the technology field, Hansen served in senior leadership positions at AARP from 2002 to 2007, most recently as Group Executive Officer, State and National Initiatives. In that role he directed all federal, state, and grassroots advocacy initiatives nationwide and managed more than 50 AARP offices and 750 staff in Washington, D.C. and across the nation. Hansen also has more than 15 years of experience with the Boeing Company, where he led all federal, state, and international government relations. In his position as Senior Vice President, Government Relations, he served as a corporate officer and executive council member. His earlier experience includes management roles in the government relations group at General Dynamics. Hansen holds an undergraduate degree in political science from the University of Denver and a master’s of International Management from the American Graduate School of International Management. He has held a number of leadership roles in professional organizations, including the U.S. Council for International Business, the National Aeronautics Association, the National Bureau of Asian Research, and the Individual Investors Committee of the New York Stock Exchange. He has also been active in philanthropic organizations such as the Wolf Trap Foundation.